We’ve seen an awful lot of Jeep Scrambler stuff lately, so I’m hoping you’re not sick of it yet and are willing to endure a bit more, because this is interesting. A reader and motorcar-pilot named Angelo sent me this video of a Scrambler and another truck (a new Ram?) engaged in some sort of testing involving some odd trailers. Yo, what the hell, indeed. 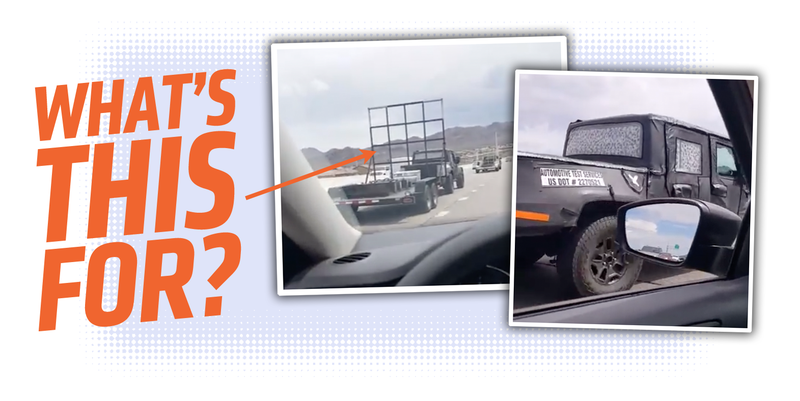 The trailers must be for evaluating towing ability and capacity, and while I’ve never actually seen test trailers quite like these before, I’m guessing they’re familiar to those in the business. From what I can tell, there seems to be a place there for installing or removing weights, which I expect is how they figure out maximum towing ratings. What I’m puzzled by, though, is the massive grid-like framework at thefront of the trailer; what the hell is that for? The weights themselves are dense and low, and don’t require much in the way of an upper superstructure. Is that grid-thing used for some kind of aero drag tests? Perhaps the grid’s squares can be sealed with panels to increase drag as needed? I looked up the DOT number on the side of the Jeep and found it is indeed Automotive Test Services, and called their number to ask. I was able to get ahold of a representative named John Singleton, a friendly guy who laughed when I asked what that big grid thing was for. “We have some of the ugliest trailers,” he told me, laughing. So, there you go! Those trailers aren’t some hyper-advanced strain sensing rigs, just ugly things that do a job. I guess they work! Now someone please find a picture of one of those with the newspaper and feathers on it for me.